In this video, Joshua & Ryan talk about why they don’t want to clutter their podcast with advertisements. 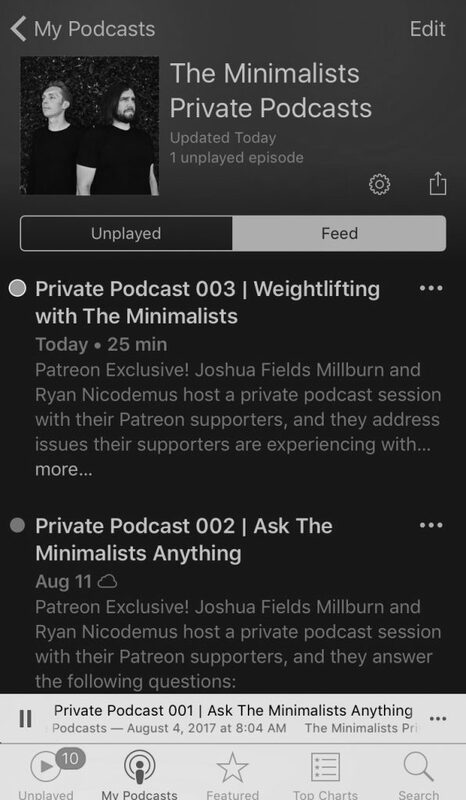 If you want to help The Minimalists Podcast stay 100% advertisement-free, you can support our show on Patreon, which will give you access to a growing archive of Patreon-only Private Podcasts and Livestreams. Our next Ask The Minimalists Anything Livestream is tomorrow, Saturday, September 2, 2017. This is where we’ll first announce the city we’re moving to after five years in Missoula, Montana. If you can’t attend the Livestream, you’ll have access to the recorded video. As you can see below, we’ve already published a handful of exclusive Private Podcasts, to which you can receive instant access as a patron. Thank you for helping us create something meaningful. Your support is truly appreciated.